How long should you give a restaurant, after it opens, before you expect them to have everything running smoothly? American Kitchen has been open since August 25, the food is good but the place isn’t working the way it should. There was a tremendous amount of angst surrounding the opening and operation of this place, with lawsuits and restraining orders–I read all about it in this article. The operating partner, Victor Ivry, is the man behind Table 24 and Barbacoa in Orinda, though, so there’s some serious expertise here. In what is rapidly becoming the Lafayette gourmet ghetto, American Kitchen is next to Chow, near The Cooperage, close to La Finestra and Roam burgers. It’s a little house that used to be a tea room, with outside tables and a very attractive fireplace where it appears they supply blankets to savor a cool winter evening. This is not a fancy, white tablecloth kind of place. They are open for three meals a day, use paper napkins and don’t have tablecloths. The silverware is the hip kind where nothing matches–or maybe they just bought it all at Goodwill. The meal is never off to a good start when I order my iced tea and get told it’s peach.What’s wrong with plain old Lipton? 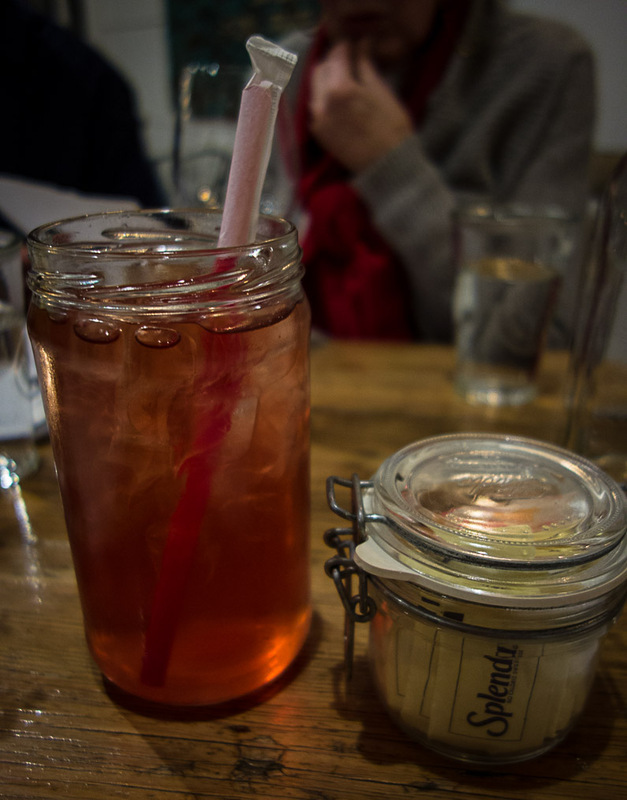 Not only did I have to suffer through some miserable frou-frou substitute for manly tea, they serve it in a mason jar. Apparently it’s hip to be a California restaurant pretending to be from lower Arkansas. Tea is not supposed to be red. The menu is casual local, and comfort food oriented. Three of our party ordered the caesar salad. It looks good, but there’s something missing. 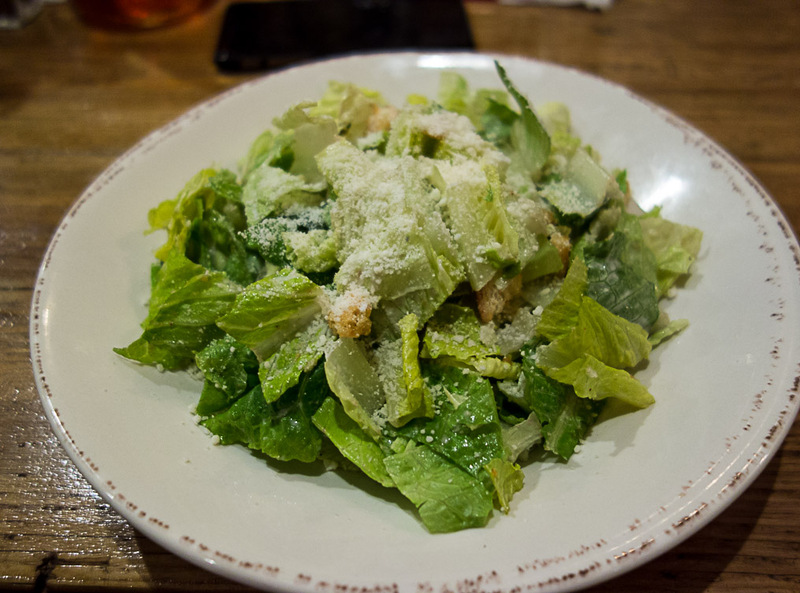 The salads looked good, but seemed to be lacking something—dressing. Perhaps there was a drop of dressing somewhere amongst the lettuce leaves, perhaps they forgot it entirely. In any event, these were salads that should never have been released from the kitchen. The restaurant business is hard, and you have to watch every penny. American Kitchen keeps the costs down by charging $2.00 for the bread and butter. What the hell, the soup was great. So thick the spoon would stand up in it, rich,hearty, spiced with pumpkin-chili oil and creme fraiche. The bread was pretty good, too. Then we sat. Chatted. Talked. Socialized. Visited. Watched the world go by. About 40 minutes later the food came out. For four of us. The remaining two dishes were the extraordinarily difficult grilled cheese sandwiches, so it’s no surprise they took an additional 5 minutes. This was not the fault of the waitstaff–I could see our waiter rushing about constantly, taking care of his customers, doing his side work, keeping the place clean. The problem, I believe, was entirely in the kitchen which lacks the ability to keep up with a moderate amount of business on a Sunday night. What they do when it’s busy is frightening to consider. The food, when it arrived, was good. To me, meatloaf is what you eat when you run out of money before you run out of month, but some people seem to like it. 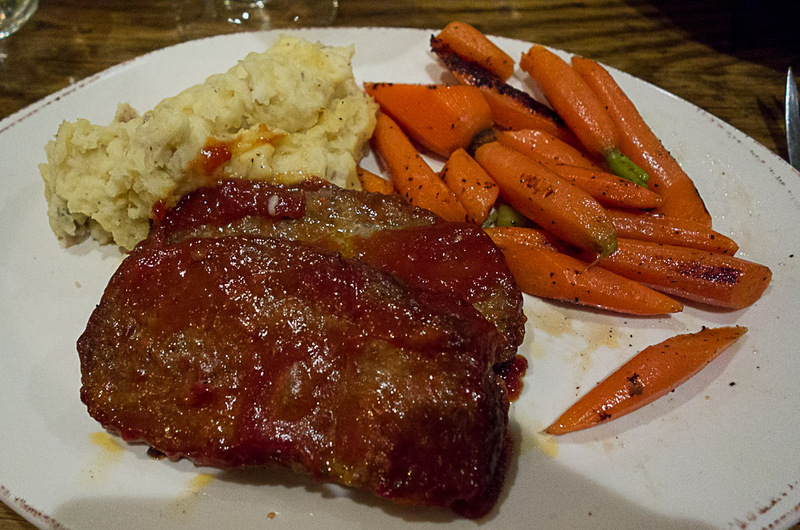 A nice presentation of serious comfort food–meatloaf, mashed spuds and carrots. Gail’s greatest comfort food is a grilled cheese sandwich, preferably with tomato soup. American Kitchen didn’t have the soup, but she went for the sandwich anyway. 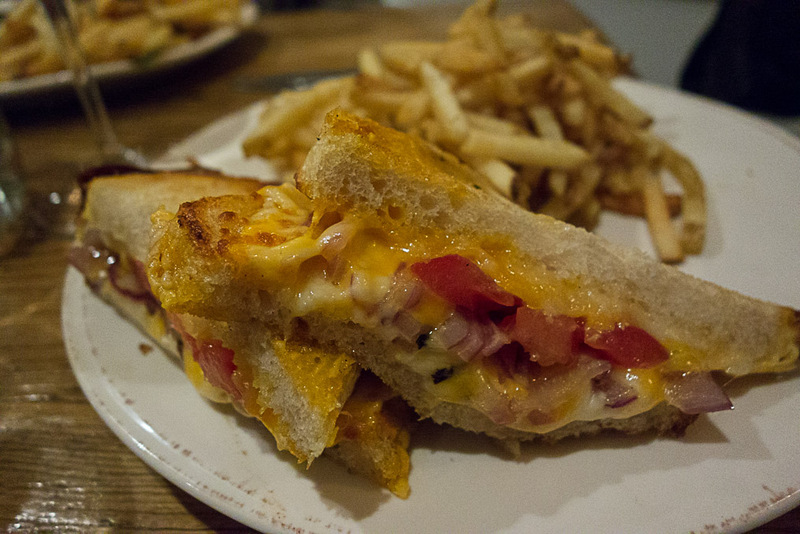 Cowgirl creamery grilled cheese with tomato and onion. Somewhat better than what mother used to make. 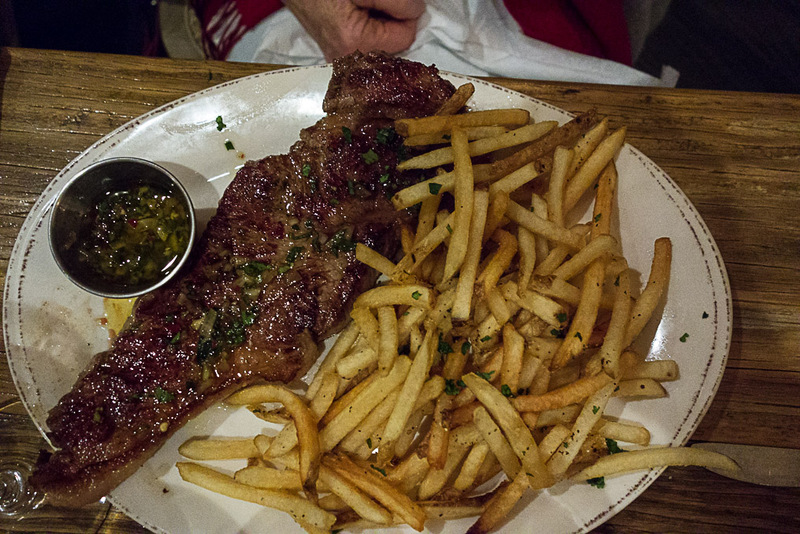 Nothing says American like a New York steak and fries. The steak was properly cooked, tender and tasty. The fries were nice and crispy, with no mealiness in the center. I had the shrimp and grits. A half dozen large sauteed shrimp served over grits with capers and a pan sauce. Comfort food if you were born in a bayou, a bit exotic for a boy from Brooklyn. I loved it, but my photo is lousy so you’ll have to take my word for it. The food here is good, except for the silly iced tea situation. The waitstaff are hopping, but the kitchen seems to be disorganized and poorly run. Sending out salads without dressing is unacceptable, and that sin pales in comparison to the unforgivable wait to get the first 2/3 of our dishes. There is no possible explanation or excuse for the further wait for the grilled cheese sandwiches. American Kitchen may make it, it may not.Good food, poor organization. 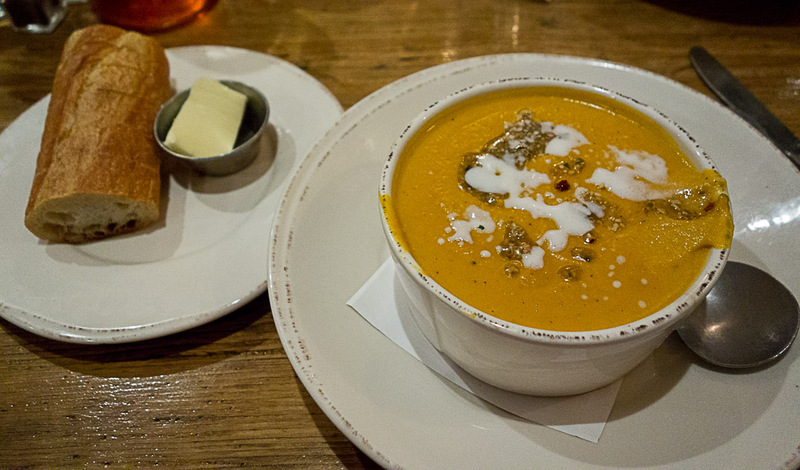 Paper napkins don’t impress me, nor does the charge for a piece of bread with my soup. Not on the recommended list.